Date: May 11 2019, 7 p.m. Sponsorship does not imply endorsement. 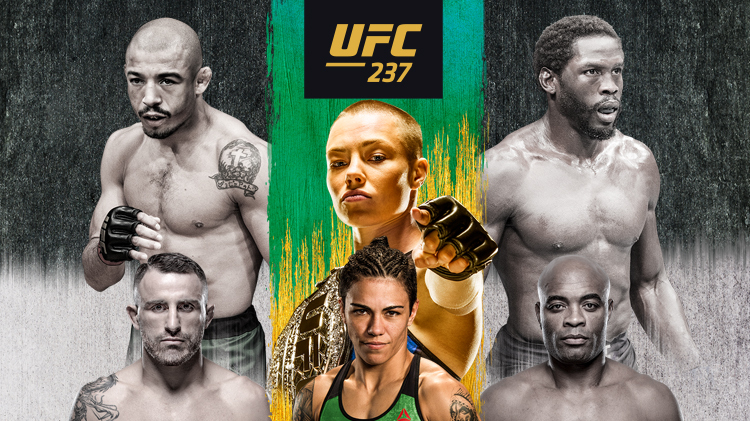 The stars will be out in force on May 11, as the Octagon returns to Rio de Janeiro for UFC 237 at Jeunesse Arena. In the five-round main event, world strawweight champion Rose Namajunas goes on the road to defend her title for the second time against Brazilian powerhouse Jessica Andrade. Plus, a pair of legends take to the Octagon, as Jose Aldo faces Australia’s Alexander Volkanovski and Anderson Silva takes on exciting power puncher Jared Cannonier. Live from Jeunesse Arena in Rio de Janeiro, Brazil. Free and Open to All with bar services and menu options available for purchase.